Introducing the new 10 ply rated Kanati Mongrel tire! GBC continues to push forward in the world of UTV tires with the release of their popular Mongrel, now available in a 10 ply rated construction. It features a re-engineered casing all while keeping the tire weight to a minimum. The improved sidewall has greater puncture resistance and increased reliability. The Kanati Mongrel tire is best suited for rocky trail, desert, general trail riding, hardpack and paved roads. 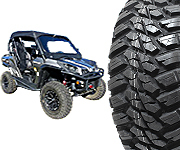 It is the first true all-purpose DOT tire built specifically for Side-by-Sides and UTV's. The Mongrel's tread is optimized for peak performance on multiple surfaces with diamond shaped lugs. The Mongrel can handle a variety of off-road terrain while remaining equally safe and suitable for paved surfaces. The tread block and lug design provide a stable contact patch with a 58% void ratio that digs into a variety of terrain. 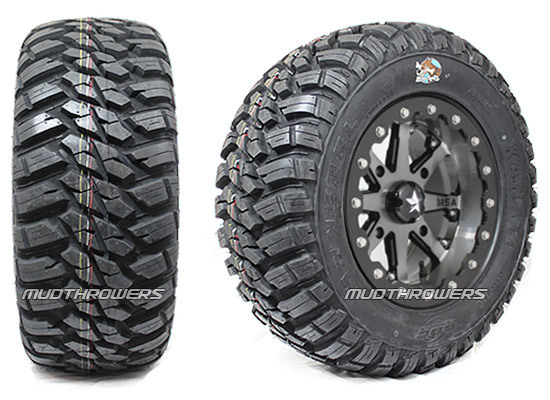 The overlapping centerline tread provide both off-road traction and smooth ride on pavement. Perfect for heavier Side-By-Sides and UTVs!